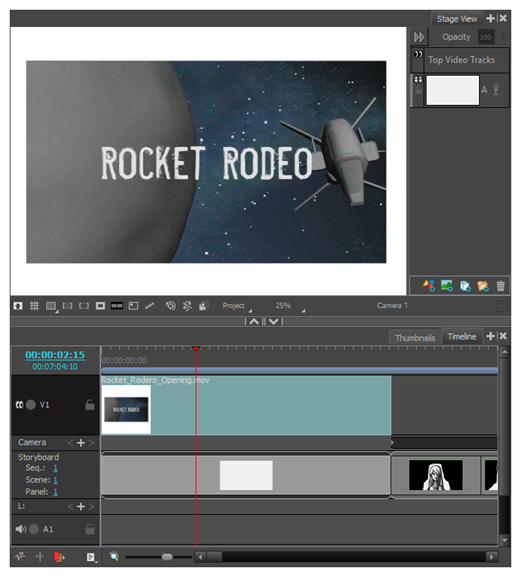 Storyboard Pro now features video tracks, in which you can add image or video clips to display them in your animatic. 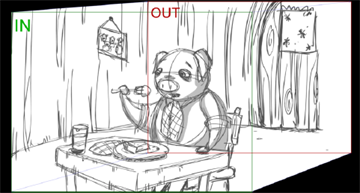 Video tracks can be placed above or below the storyboard track, to make its clips display over or underneath the artwork in your animatic. 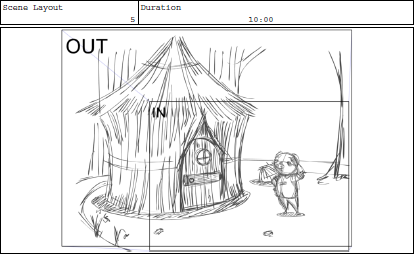 Image and video clips can span over several panels or scenes and be cued and clipped at any time in the animatic. They can be transformed and animated, just like layers in a panel, but contrary to layers in a panel, they are not affected by camera movements. For more information, see About Image and Video Clips. Audio and video track reordering It is now possible to reorder audio tracks as well as video tracks—see Reordering Audio Tracks and Reordering Video Tracks. Audio and video track renaming It is now possible to assign custom names to audio tracks as well as video tracks—see Renaming Audio Tracks and Renaming Video Tracks. You can search for a sound clip in your animatic by entering part or all of its file name and going through each matching result—see Searching Sound Clips and Find Sound Clips Dialog Box. You can now display the timecode of the current frame in the top-left corner of the Stage and Camera view by clicking on the Timecode button in the status bar—see Stage View and Camera View. The new Stamp tool can be used to stamp one or several drawings into your artwork. You can stamp drawings one at a time or draw strokes with it. The behaviour of the stamp tool when drawing strokes can be customized in many ways—see About the Stamp Tool and Stamp Tool Properties. NOTE The Stamp tool replaces the Dynamic Brush option of the Brush tool in Storyboard Pro 5.5 and earlier. The Brush tool now has the same texture drawing capabilities when used on vector layers as when used on bitmap layers—see Creating a Textured Brush and Brush Tool Properties. The Centerline Editor tool allows you to manipulate brush strokes, whether solid or textured, by their centreline, giving you better control over their shape than the Contour Editor—see About the Centerline Editor and Centerline Editor Tool Properties. The Contour Editor, Envelope and Perspective tools can deform the texture in textured vector brush strokes. 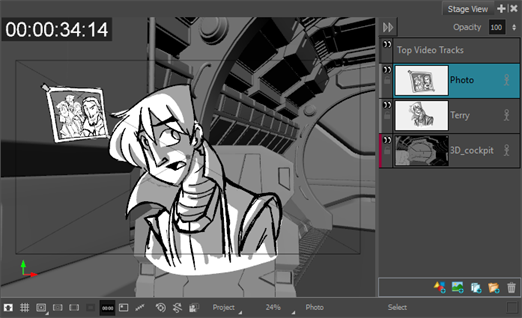 The Polyline tool, which was available in Harmony, has been added to Storyboard Pro. With this tool, you can draw segmented lines or shapes by creating each point composing the line, allowing you to draw shapes with precision. The lines created with the Polyline tool can be straight or curvilinear—see About the Polyline Tool and Polyline Tool Properties. Onion Skin for Selected Layers Only You can now enable Onion Skin only for currently selected layers. When this option is enabled, only artwork in layers that have the same name as the selected layer in surrounding panels will appear in the Onion Skin—see Enabling Onion Skin for the Current Layer Only. Merge Down There is now a command to quickly merge the selected layer with the layer just below it. You can access it in the Layer menu, a layer's contextual menu or by pressing Ctrl + E (Windows) or ⌘ + E (macOS)—see Merging Layers. The Perspective tool can now be used in either Perspective or Lattice mode. The Perspective mode deforms the drawing by simulating a perspective effect, whereas the Lattice mode simply deforms the drawing to make it fit the shape of the control box—see About the Perspective Tool Modes and Perspective Tool Properties. Directional Blur In the Directional Blur dialog, you can now set the angle of the blur by clicking and dragging on a dial—see Directional Blur Dialog Box. Multiple layers templates You can now create templates with a selection of multiple layers. Importing such templates into a panel will add all of its layers to the panel—see Creating Templates and Importing Templates. Multiple panels templates You can now create templates with a selection of multiple storyboard panels. Importing such templates into a project will add all of its panels to the project—see Creating Templates and Importing Templates. Insert panel template in Timeline view You can now insert a template made of one or several panels between two panels in the Timeline view. In the past, this was only feasible in the Thumbnails view—see Importing Templates. When attempting to add a 3D model to a 2D scene, you now have the option of rendering the 3D model into a 2D layer so it can be added to the scene without converting it to a 3D scene—see Adding a 3D Object as a Rendered Image in a 2D Scene. A Render Scene Layout Panel option was added to the Panel tab of the PDF Profile dialog. When enabled, each scene that has a camera movement will have special "layout" thumbnail added before the thumbnails for its panels. The layout thumbnail contains the camera movement for the entire scene as well as the artwork of the first panel in the scene—see PDF Profile Dialog Box. The Display Camera Mask option was added to the Panel tab of the PDF Profile dialog. When enabled, a mask covers the part of the panel that is not covered by the camera frames or the camera's trajectory. This means that only the artwork that is covered by the camera will be visible in the thumbnails. The colour of the mask can be customized—see PDF Profile Dialog Box. Frame Snapshots A Frame Snapshot option was added to the Panel tab of the PDF Profile dialog. When enabled, panels containing snapshots will be rendered from the point of view of the camera at the time of the snapshot. The panel's thumbnail will only display the artwork inside the camera frame, and the camera movements will not be rendered over the thumbnail—see PDF Profile Dialog Box. When a panel has several snapshots, it is now possible to export all the snapshots for that panel in different image files. Previously, only the main snapshot of a panel was exported when exporting bitmap images, and it was only possible to export several snapshots for a single panel when exporting to PDF. For more information, see About Snapshots, Exporting Bitmap Images and Export Bitmap Dialog Box. 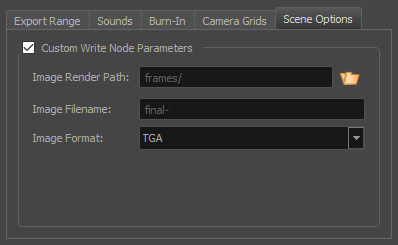 It is now possible to configure some of the rendering parameters of the Write node when exporting Harmony scenes, namely the location, prefix and image format of rendered frames—see Exporting Harmony Scenes and Export to Harmony Dialog Box. Group layers Group layers in your project now get exported in Harmony scenes. Drawing layers are created inside their respective group, under a peg which preserves the group transformations and animations. Exposure of rendered frames When exporting Harmony scenes as rendered images, static images are no longer rendered over and over again at every frame. Instead, they are rendered once and exposed until the image changes, saving on export time and disk space. When exporting over existing Harmony scenes, you now have the option to overwrite all Storyboard Pro scenes with conflicting names simultaneously, instead of having to specify to overwrite each conflicting scene one at a time. Export both Merged and Individual Tracks When exporting Storyboard Pro scenes, you can choose to export each scene's audio in both separate audio tracks and one mixed down audio track. Both the individual audio tracks and the merged audio track will co-exist in the exported scenes—see Exporting Harmony Scenes and Export to Harmony Dialog Box. Export both Merged and Individual Tracks When exporting audio, you can choose to export the audio tracks in your project separately and mixed down into one audio track at the same time—see Exporting Sound Files and Export Audio Dialog Box. Only merge modified panels (Track changes) When merging and replacing projects that were extracted from your current project, you can now choose to only import panels that were tracked as changed in the projects being imported—see Merging Projects and Replacing Scenes in the Current Project and Advanced Merge Storyboard Dialog Box. When merging and replacing projects that were extracted from your current project, you can choose to ignore the changes in the timing of panels and scenes as well in the position and animations of layers, and only import the changes done on the project's artwork—see Merging Projects and Replacing Scenes in the Current Project and Advanced Merge Storyboard Dialog Box. 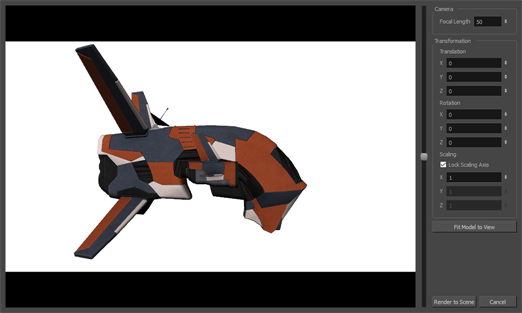 Optional image rendering When exporting your project for conformation, you can elect to skip exporting the images. This can be useful if you have already exported your project and need to export it again, but don't want to wait for the images to be rendered again—see Exporting for Conformation and Export Project / Selected Scenes / Tracked Scenes Dialog Box (Conformation). When importing a sequence into your Storyboard Pro project, you can elect to not import the panels, and only import the audio tracks or the captions instead. With this option available, you can export a soundtrack composed in a video editing software into an XML or AAF sequence, then import it into your Storyboard Pro project without affecting your storyboard panels. For more information, see Importing an Edited XML or AAF Sequence back for Conformation and Conformation Import Project Dialog Box. Rectify Static Camera The Rectify Static Camera option has been added to the Conformation Export dialog. This option makes it so scenes in which the camera is at an angle and does not have any camera movements are rendered as if the camera was straight—see Exporting for Conformation and Export Project / Selected Scenes / Tracked Scenes Dialog Box (Conformation). By default, when adding transitions, the length of the project shortens by the length of the transition. This is because a transition causes the next scene to start playing before the current scene finishes playing. With this option enabled, adding a transition between two scenes will automatically extend the length of both scenes by half the length of the transition, allowing the project to remain the same length. This preference was added to the General tab of the Preferences dialog—see General Preferences. By default, when Auto Tracking Mode is enabled, any change made to a panel will activate tracking for that panel. With this option enabled, making changes to a panel's captions will not activate tracking for that panel. It is now possible to display time in the Timeline view, the Thumbnails view and exported PDF documents in feet and frames. In the context of an animation production, a foot corresponds to a vertical foot of animation exposure sheet, which covers to 16 frames. Hence, each foot corresponds to 16 frames in your project. This preference was added to the Global UI tab of the Preferences dialog. In the Time Display Units section, each time display setting is followed by a drop-down menu in which you can either select Timecode, Frames or Feet + Frames—see Global UI Preferences. The frame class, which allows you to check and change the current frame, was created. It contains the following methods: current, setCurrent and moveFrames. The following methods were added to the LayerManager class: isShared, isEmpty and mergeLayers. Additionally, the getLayerSelection method was added to the SelectionManager class. Timeline markers The TimelineMarkers class was created. It contains several methods to manage timeline markers in your project. Tool presets The ToolPresetManager class was created. It allows you to list and select tool presets. The setPanelColor and getPanelColor methods were added to the StoryboardManager class. The exportToAAF method was added to the ExportManager class, allowing you to script the export of your project as an AAF sequence for conformation. For more information, see Storyboard Pro Scripting Reference. Fixed issue where curved lines drawn quickly with pen tablet would appear segmented and dented with low-end video cards. Fixed issue where overwriting a Storyboard Packed File (.sbpz) when splitting or extracting the current project would delete the target project's parent directory. Fixed a crash caused by an error message occurring when the computer wakes from sleep mode. Fixed a randomly occurring crash when animating a layer. Fixed a memory leak that occurred when deleting panels while their thumbnails were about to be generated. Fixed crash when flipping a scene if the Stage or Camera view are not in the current workspace. Fixed a rare crash when dragging and dropping the last scene of a project to move it earlier in the project. Fixed a crash when opening an already open project using the command line with the argument -panelid and cancelling on the dialog alerting that the project is already open. Fixed issue where scale factor of 3D models would not be preserved in exported Harmony scenes. Fixed issue where attempting to generate an auto-matte on a shared drawing would discard the shared drawing. Fixed issue where exporting a dynamic brush preset containing multiple drawings and importing it under a different user account would only import the first drawing of the dynamic brush. NOTE Dynamic brushes have been renamed Stamps in Storyboard Pro 6.0. Fixed issue where a shared drawing would be flipped all across the project when flipping a scene containing the shared drawing. Now, a shared drawing that is in a scene that gets flipped will be unlinked from the original drawing and linked to a flipped version of the shared drawing, which is also shared. Fixed issue where pen tablet input would be offset when working with several monitors set to different scaling factors on Windows. Fixed an issue where flipping a scene would not work if the scene contained a shared drawing and an even number of panels. Fixed issue where converting a shared drawing from one art type to the other would not update the art type of the original shared drawing. Fixed issue where exporting a Windows Media Video (.wmv) file would fail without any error message if attempting to overwrite a file that is opened in a movie player. Fixed issue where projects split or extracted in Storyboard Packed File (.sbpz) format would have the project title extractproject_temp. Made the Split Project and Extract Project dialog create projects in the current project's format (.sboard or .sbpz) by default. Fixed issue where background layer of current panel would appear over onion skin. Fixed the icon that appears over panels in the Thumbnails view when the Lock Scene and Panel Names option is enabled. Fixed issue preventing from selecting layers in very short panels when making a selection of layers from multiple panels. Fixed issue where applying a blur effect on a selection of multiple layers across multiple panels would ignore layers in very short panels. Fixed issue where panels got expanded even if the Panels > Expand Panel PDF option is disabled when exporting a PDF with one panel per page. Fixed issue where camera framing would be wrong when exporting a project in 16 field for conformation. Fixed issue where the waveform would not be immediately visible for sound clips that were added to the project by copying and pasting them, or by importing a sequence for conformation. Made the General tab the default tab in the PDF Profile dialog. Fixed issue where timeline markers would appear selected when scrolling the Timeline view until the currently selected timeline marker was out of the visible range. Fixed issue where buttons in the Find Text in Captions dialog would appear too big and overlap each other on macOS. The Browse button in the Split Storyboard dialog in High DPI / Retina Display mode. Cropped text in the Japanese Welcome Screen. Untranslated options in the Blur dialog. Untranslated tool tips of the Play and Play Selected Panels buttons in the Pitch Mode workspace. Untranslated list names in the script selection dialog.